2016 Edición Limitada cigars: Romeo y Julieta Capuletos (left), Montecristo Dantes (center), and Trinidad Topes (right). Two of the 2016 Edición Limitada cigars announced by Habanos S.A. last February—Trinidad Topes and Romeo y Julieta Capuletos—have started arriving in Casas del Habanos around the world, while the third remains out of sight. Distributors and shop owners in Canada and the Middle East report that the special Trinidad and Romeo are now available for sale. The Casa del Habano in the Teddington part of London, run by Ajay Patel, reports that the Capuletos has arrived, but not the Trinidad. And the official distributor for Cuban cigars in Mexico says both ELs are in their main warehouse in Havana and expected to start selling in Mexico in early December. 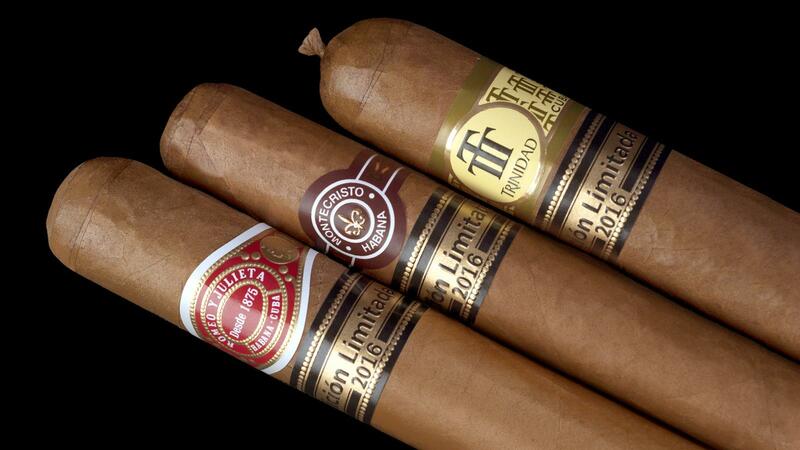 The third Limitada, the Montecristo Dantes, is a bit more elusive. None of the distributors or shop owners surveyed report having the cigars. In Germany, one Casa del Habano operator says he expects them in the shop by December 1. The Trinidad Topes (also the factory name for this size) is a thick gauge robusto, nearly five inches long with a 56 ring gauge, and another addition to Habanos S.A.'s strategic decision to develop heavy ring gauge cigars. The Romeo y Julieta Capuletos is a 6 by 53 cigar, also known by its factory vitola name, Sobresalientes. It represents a new size in the commercial lineup of Habanos cigars. The Montecristo Dantes is 6 5/8 by 48, otherwise known by its factory name, Hermoso No. 1, or a gran corona. The Capuletos made one of its first appearances in September at a dinner in Verona, Italy. The Trinidad has trickled out this fall, and now the cigars seem to be available in many markets. Like previous years, the Edición Limitadas have reached the world market near the end of the calendar year in which they were announced. For the last three years, tobacco shortages from mediocre harvests have complicated the production and delivery of Habanos' special releases. The Cohiba Medio Siglo, a 4 by 52 short robusto, was announced as part of the brand's 50th anniversary celebration this year, and is also beginning to reach retailers. Mexico, Canada and the Middle East already have received their shipments, but the cigar was not to be seen on a recent trip to Cuba a few weeks ago. It is part of the regular Cohiba portfolio. Another new regular-production cigar, the H. Upmann Magnum 54, a 4 3/4 by 54 cigar, is now widely available worldwide. The format is also called a Magnum 54 in Cuban factories and is a new size developed especially for this release. Other special Cuban smokes are expected to hit their respective markets soon. In the United Kingdom, the launch party for Britain's new Regional Edition Juan Lopez Selección Superba (which measures nearly 6 inches long by 54 ring gauge) is slated for November 10. In Mexico, the Edmundo Dantes Conde Belicoso, Mexico's third Regional Edition under the Edmundo Dantes label, is scheduled to be available in early December.